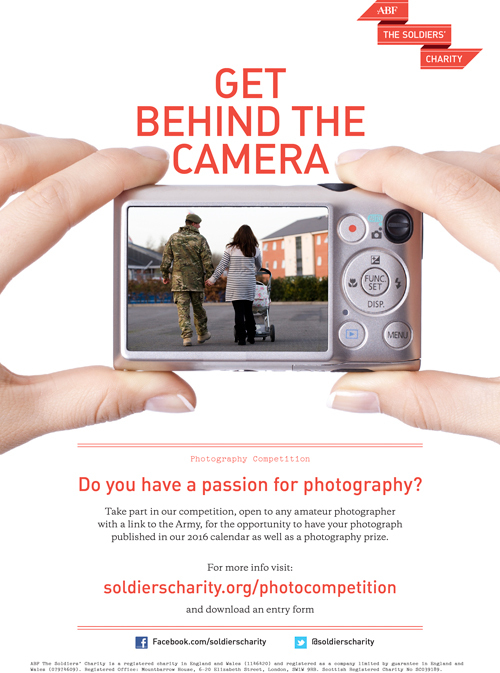 THE search is on for inspiring pictures for ABF The Soldiers’ Charity’s 2016 calendar – could your super-snap feature? The competition is open to anyone with a connection to the Army. Winners will not only feature in the 2016 calendar but also receive a range of photography prizes. The winning entries will be chosen by a panel of leading figures including actress Jenny Agutter, Royal Photographer Arthur Edwards, Major General (Ret’d) Rutledge and Chief of General Staff, Lieutenant General Nick Carter. Arthur Edwards added: “It will be fascinating to see how the breadth of the Army family is captured in this competition and I think we will see a very high calibre of entries. The competition closes on 30 April 2015 and entries will be shortlisted before being put forward to the judging panel, with the winners announced at the end of May 2015.